1.5 km al N, San José, Costa Rica. Model United Nations (MUN) is a program that simulates the work of the United Nations to solve national and international issues through dialogue. For us, high school students, it has served as a safe space to discuss, negotiate and propose viable solutions while defending the position of a certain nation or leader; where not only diplomacy is being put to practice, but communication skills, creativity, teamwork, and commitment as well. It has allowed us to connect with other students our same age from all over the country and even abroad who share different views on international affairs due to diverse backgrounds and interests. 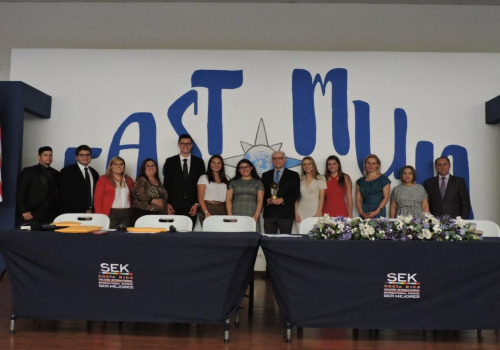 Our school hosted the third edition of East MUN, a joint effort among students from Anglo, Saint Clare and SEK schools. We received over 350 delegates from more than 15 institutions who were willing to invest one entire weekend to discuss an agenda with topics like The Nicaraguan Crisis, The Protection of Cultural Heritage in War Zones, Human Experimentation, Criminalization of Refugees, Sexual Education Guides and many more. We also had a special guest, Eduardo Ulibarri, former Costa Rican ambassador in the United Nations, who spoke about this year’s topic, The Crisis of Multilateralism. MUN is indeed an outstanding opportunity, similar to no other program, to train future leaders and create phenomenal students interested in changing their community and the world.